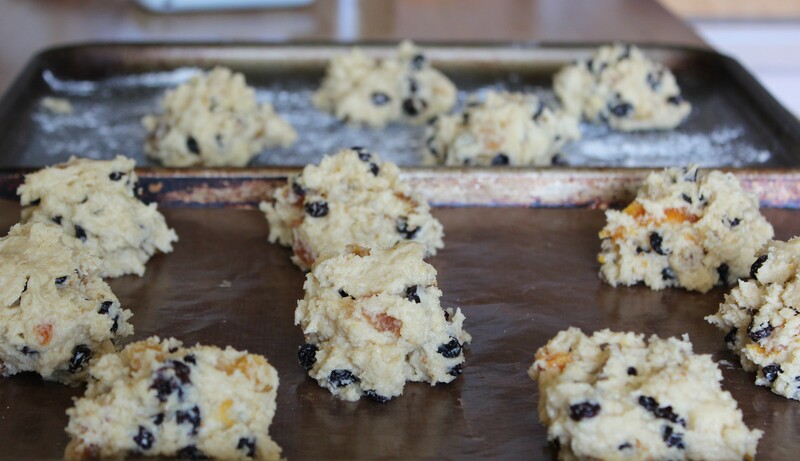 Home › Baking › Beside the Seaside: Rock Buns, of course! 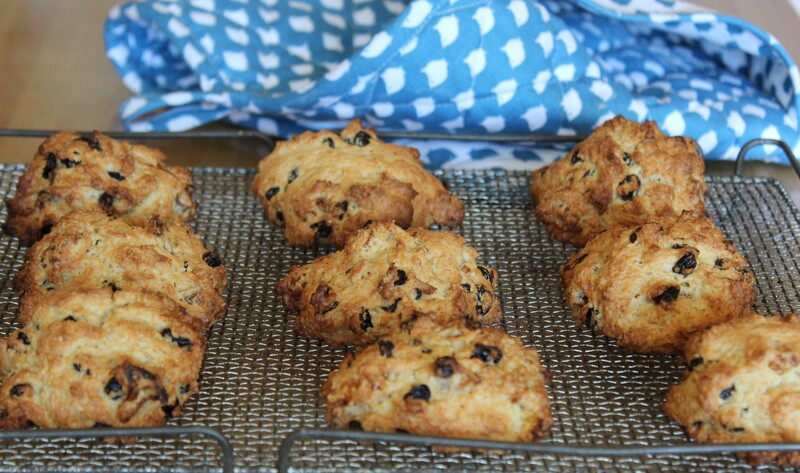 Beside the Seaside: Rock Buns, of course! We have been visiting my parents again, who live on the Isle of Wight in the south of England. They are a five-minute walk from the beach and it really couldn’t be a better place to visit with the kids. The beach is a great place winter or summer, rain or shine. The kids don’t care if it is raining or cold: they just need the right clothes. I grew up next to the sea and really miss it. I just like to know it’s there: it must have something to do with the unlimited space. Where we lived when we were growing up there was no land to be seen on the horizon: just the sea and distant boats. My parents have moved round the coast and in some places you can see the mainland and it looks very close. For some reason I don’t like that! I prefer to go to the beach round the corner with the unrestricted view. 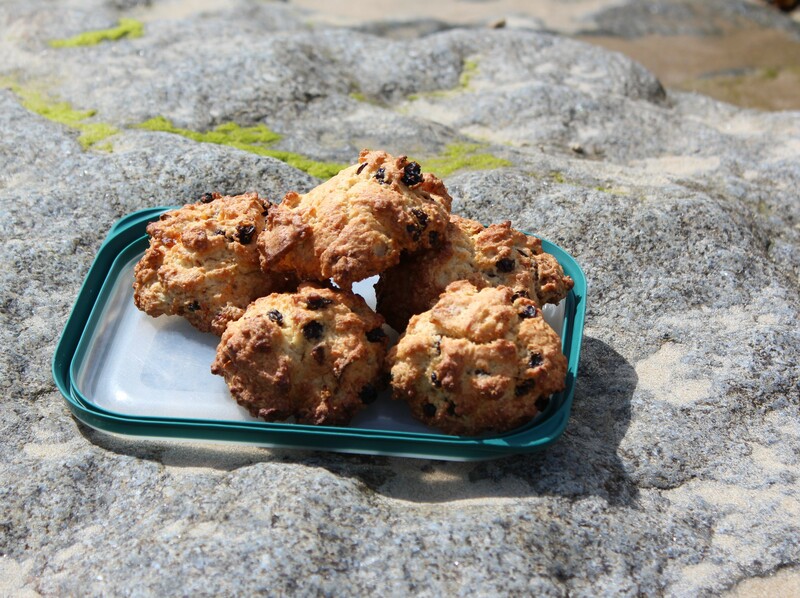 So what better thing to make for a quick snack on the beach than some rock buns? They are very similar to scones and are named for their shape and not, as you might think from some you can buy, for their texture! Homemade rock buns are light and fluffy. They are not a rich mixture so are much better the first day as they will go stale quickly. If you are not going to eat them all they will freeze well for another day. Traditionally they are made with mixed dried fruit and candied peel but I chose to use dried apricots and figs along with some currants to make a bit of a change. They are very quick to make and bake and perfect for younger children to make with you. If you have older children just ask them to make them for you! Set the oven to 190ºC and flour or line a couple of baking trays. Put the flour, baking powder and sugar into a large bowl and rub in the butter or margarine until the mixture resembles breadcrumbs. Mix in the dried fruit and then the egg and milk. Mix until well combined and then put large heaps of mixture onto your baking tray. Make sure they are heaped rather than flattened otherwise they will turn out more like cookies. Bake in the oven for around 15-20 minutes. I made 12 buns but you can make them larger if you prefer. Just make sure you bake them until they are well browned and cooked on the inside. Remove from the tray and place on a wire rack to cool. We had some warm from the oven and then took the rest to the beach as a snack later on. The weather is not as hot and sunny as it has been but it is still great to be on the beach. The water feels warm if you keep moving, or so my son says! On the days when the kids haven’t wanted to spend the day on the beach, we have gone for a walk after dinner and they have had just as much fun in the evening at the beach. It is such a beautiful place to be: we consider ourselves very lucky! I love rock buns – and beautiful pics too! 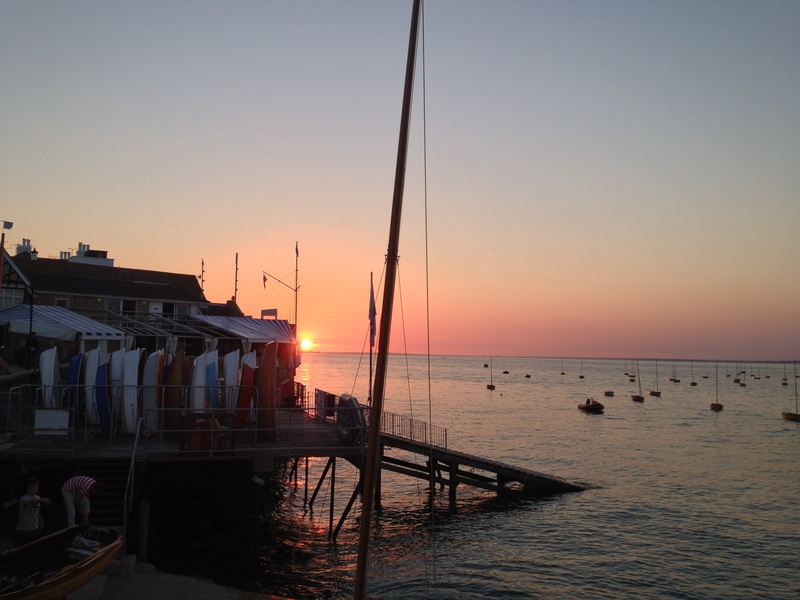 I know what you mean about the coast being so compelling when you’ve lived by the sea… any part of the coast always feels a little bit like coming home to me… enjoy the rest of your time on IoW! You are lucky. I love the beach. I could stare at the water for hours. Mmmm! These look beautiful and great pictures!